Distinguish your teaching of myofascial self-care for every client and context. Join us at Razz Yoga on Saturday and Sunday, January 19 and 20, from 11:30 am to 7:30 pm for the two in-person modules of the Roll Model® Method Practitioner training with Alison Pignolet. 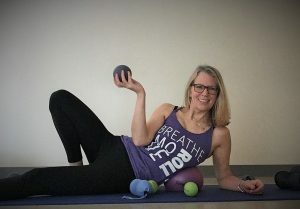 These trainings empower you to teach and personally adopt simple and effective self-myofascial release regimens using Yoga Tune Up®/Roll Model® Method Therapy Balls. You will learn how to incorporate RMM/YTU Therapy Ball sequences into your teaching toolkit by introducing embodied anatomy concepts to your students or clients. Roll Model® Therapy Balls (including the original Yoga Tune Up® Therapy Balls) are a soft-tissue conditioning tool that can be used as an adjunct offering within yoga, personal training, group fitness, Pilates, corporate wellness, dance, massage therapy, clinical or mental health settings, including children and special populations. 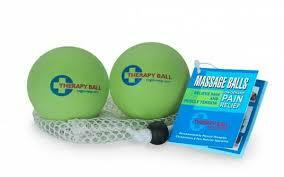 These on–the–go balls improve body coordination, reduce pain and improve movement. This course will enable you to immediately add these techniques to your teaching. Skillfully lead classes through 6 step-by-step, proven, whole-body sequences—approved by physical therapists, pain medicine specialists, and chiropractors—that can affect positive changes in the rotator cuff, upper back, lower back, neck, jaw, hips, IT band and feet. 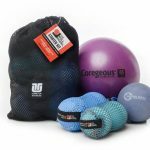 Maintain your body and prevent injuries using self-care strategies with the original Yoga Tune Up® Therapy Balls. Deepen your understanding of pain physiology and how the Therapy Balls can help alleviate pain. This immersion provides a wide variety of soft-tissue self-care solutions for every client and condition utilizing all four different sized Roll Model® Therapy Balls. You will refine your teaching skills and learn to effortlessly craft innovative moves and sequences to differentiate your teaching for any individual or community. Explore self-myofascial release in areas of your body frequently over-used, like the hands and knees, or completely ignored like the diaphragm and pelvic floor. We will practice 6 sequences (different ones than in Science of Rolling). These modules are open to all levels of student/educator/clinician. There is no pre-requisite to attend except an interest in diving deep into the techniques of rolling, why it works and how to share it with others. Tuition for each training individually is $295 ($265 if paid by Dec. 29). Receive $50 off if registering for both (so $480 if paid by 12/29). Registration for Science of Rolling includes a set of Original Yoga Tune Up®Therapy Balls, online access to a DVD of the six sequences you will learn and a manual. Registration for Ball Sequencing and Innovation includes the Roll Model® Method Starter Kit – a set of orignal balls, Plus balls, one Alpha ball and a Coregeous ball in a drawstring tote – plus a manual. Yoga Tune Up® teachers receive a $25 discount. Become a leader in the self-care fitness revolution! Ready to Roll??? Register Here. Cancellations and refunds – full refund less $25 administration fee if cancellation received 3 weeks prior to the event. 50% refund if cancelled within 3 weeks (or apply your enrollment to a future event). Cancellations within 24 hours – we will be happy to apply your enrollment to a future event. Upon completion of either of these training you will be able to skillfully incorporate RMM balls and techniques into your teaching. If you want to use the Roll Model® name and branding in your class titles and descriptions, be identified as a Roll Model® Method practitioner and be listed on the Tune Up Fitness website, you can continue on the certification path. To earn the certification, you will be required to: take both Science of Rolling and Ball Sequencing and Innovation; complete the homework for Science of Rolling; and complete an online correspondence course and test based on the videos from Science of Rolling and The Roll Model® Method book. As a certified Roll Model® Method Practitioner you will be recognized as having gone through the proper educational training and hands on skill drills and proven to understand and apply all the core fundamentals of The Roll Model® Method. For more information visit Tune Up Fitness Worldwide.